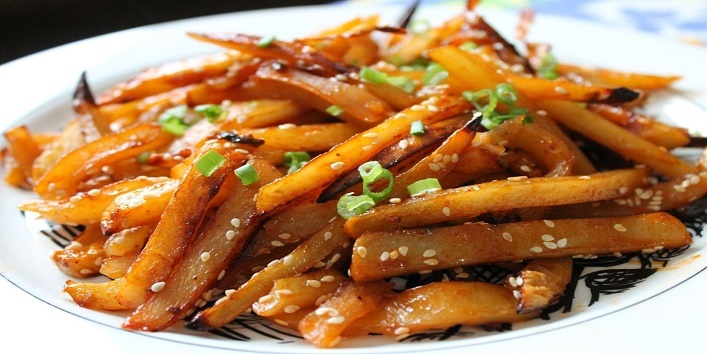 If you love Chinese food you would have definitely had chilly potato at least once. 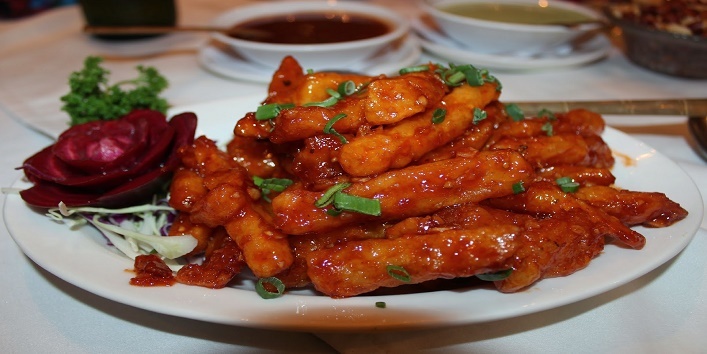 It is a Chinese appetizer which includes fried potato fingers or wedges tossed in a sweet and spicy thick sauce. The recipe is fairly easy to follow and thus you must try making this at home for your family and friends. So without any further due let’s get started with eh recipe. Red chilli paste- 2 tsp. Peel and slice the potatoes in the shape of wedges. Soak the potatoes in water for 30 minutes. Now drain the excess water, soak the excess water from the tomatoes on a kitchen towel. Add the salt, pepper and cornflour to the potatoes. In a kadhai, heat oil for deep frying the potatoes. Fry the potatoes till they are golden and crisp. Remove the excess oil from the kadhai, leaving just about 1 tbsp. to the oil add the chopped onions, ginger garlic paste and green chilli. Cook everything on a high heat for 1-2 minutes. Add the soy sauce, chilli sauce, vinegar, salt, sugar and pepper. Cook for a minute. Add the water and let it come to a simmer. Now add the cornflour dissolved in some water to the stock and cook for a few minutes. The sauce will thicken up. At this time add the fried potatoes to the sauce and mix them together. Garnish the chilli potatoes with chopped spring onions. Serve the chilli potatoes immediately.